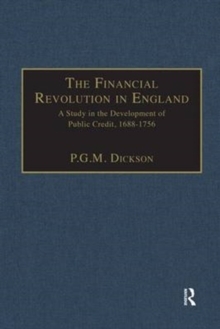 Peter Dickson's important study of the origins and development of the system of public borrowing which enabled Great Britain to emerge as a world power in the eighteenth century has long been out of print. The present print-on-demand volume reprints the book in the 1993 version published by Gregg Revivals, which made significant alterations to the 1967 original. These included a new introduction reviewing recent work, and, in particular, 33 pages of detailed annotations and corrections, which, taken together, justified its status as a second edition.